We’ve teamed up with 8coupons to add more Deals and Coupons to our inventory. 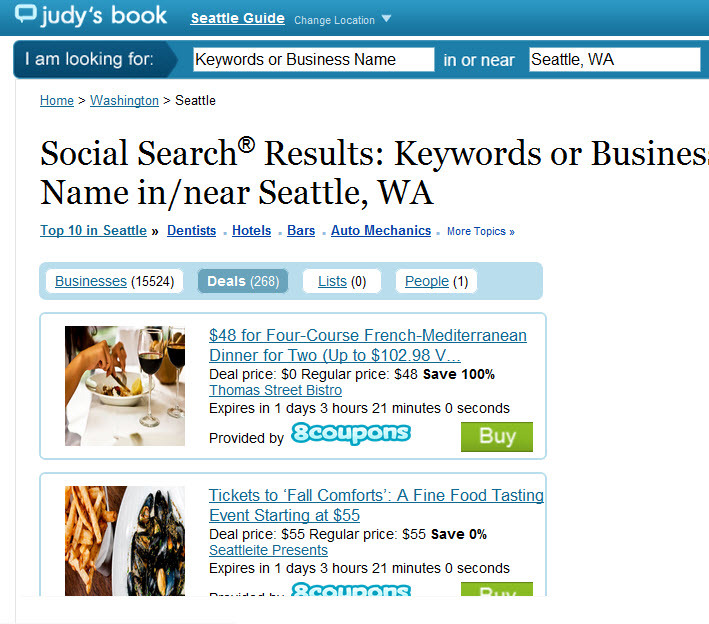 Users on Judy’s Book can view daily and other deals and free coupons for their and other cities from all the major sites like Groupon, LivingSocial, BuyWithMe, and many more, all in one place by category. Best of all Judy’s Book makes it easy to read reviews on a business before you make a decision to buy a daily deal or print a free coupon. To find Deals on Judy’s Book simply search in a category and city, after viewing the results page of place listings and reviews, click on the Deals Tab. You can also Go Hyper Local by typing in your zip-code in the location box. Here’s some deals from 10 Top cities. Did you recently buy and use a daily deal? Were you satisfied? This entry was posted in Deals, FAQ and tagged 8coupons, coupons, daily deals, deal aggregator, Deals, judys book on October 4, 2011 by judysbookblog.